Welcome to the second installment of my five-day series of visualization exercises leading up to the Marine Corps Marathon. They’re based on an old edition of Runner’s World’s “Guide to Running” that suggests using every training run leading up to the marathon to visualize a chunk of miles on race day. Last year, I found that doing so leading up to the Marine Corps Marathon really helped me enforce positive imagery and ward off pre-race worries. Today’s exercise: Visualize yourself running miles six through 10 of the race. You’re settled into your pace, and are running comfortably, taking in water and posting even splits. You feel strong and rested, and you know you’re going to have a great race. 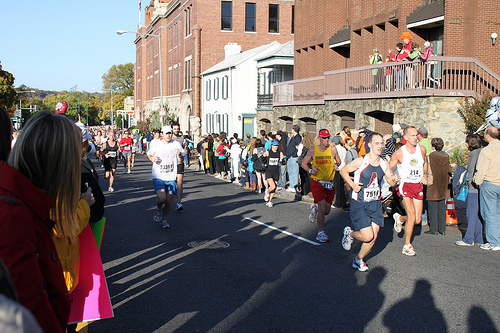 Marine Corps Marathon runners making their way through Georgetown. For Marine Corps Marathon runners, this means a somewhat steep uphill through Georgetown miles six and seven, but then a long, lovely downhill miles eight and nine. You don’t mind the hills, because you’ve trained for them, and you know you’ll enjoy a flat course the rest of the race. And Georgetown is so pretty with its tony shopping district and immaculately maintained brick rowhouses, you have plenty to take your mind off the incline. Toward the end, you’ll get to run by the Lincoln Memorial with its steps filled with cheering, sign-holding spectators from top to bottom—truly one of the most moving experiences of my life. Also, check out The Washington Post’s Marine Corps Marathon 2010 guide. It includes mini-profiles of inspiring runners, featuring a woman who trained for the race while undergoing chemotherapy.